Choose one of our new end-of-year packages and it will connect with your donors the moment it hits their hands! Your custom envelopes (with pictures of babies from your center!) will increase the likelihood of your appeals being opened. The continued theme throughout your appeal package will reach the hearts of your donors and the coordinated response card and gift item will help bring your end-of-year donations home! Each package starts with a full-color envelope printed with your address information and your image and logo. Inside is a custom letter (you can change the text!) again with your information and logo. A small custom gift bookmark is also included. The package is finished off with a customized response card with your address and custom donation options. Reach your donors as you help them see their place in the story of so many lives! This themed appeal will help increase donations by giving a vibrant picture of your work with a continual reference of how the funds that are given make all the difference. 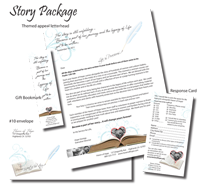 Each package includes a themed custom envelope, appeal letter, bookmark gift, and a donation card. Each piece can be customized for your center giving the personality of the call with the professionalism of the appeal package. PLUS - the small baby image on each of the custom items can be replaced with a baby saved at your center. There is not a better way to bring the reality of your mission to your donors attention! Your end-of-year appeal can do no better than to point to the real treasure - the treasure of life! Each donor can see from this appeal package the true value of your work in this life and the one to come. Professionally written and designed for PRCs, each item can be customized for maximum impact. 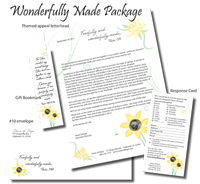 The letters can be written to fit your donors and services, the envelopes and bookmarks can have your contact information imprinted and the donor card can be customized for your needs. It is a completely custom package - ready for you to use! 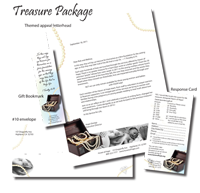 Share the truth with your donors with the new "Wonderfully Made" Appeal package. 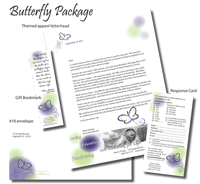 Designed in a professional yet personal themed appeal, this package will make a differnce in your end-of-year donations. Plus, the baby pictures in the flowers can be replaced with images of babies saved in your center. Don't miss the chance to increase your donations - choose this ready-to-print package today. This end-of-year appeal is a great reminder to your donors that you are saving and changing lives. Using a beautiful theme of butterflies, each piece in this custom set can be customized for you.